Introduction: Daiwa Sealine-X reels have long been a popular item for both surf and offshore anglers chucking the heavy metal. These reels are known for their casting ability, power, reliability, and aggressive price...and with the introduction of the 50SHV you can now add "high speed" to the list of desirable features. The Sealine X 50SHV boasts all the proven features of the originals with new super high speed gearing capable of a blazing 6.1:1 retrieve. Impressions: Daiwa's SealineX reels are prevalent among saltwater anglers, and the number one reason is simply due to the excellent value this reel offers. 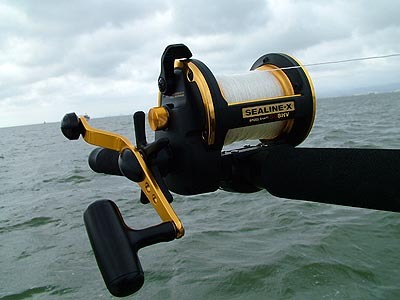 The SealineX reels deliver plenty of performance for only 135 dollars, and actually excels in a number of categories, delivering performance well above what you would expect from a sub 150 dollar offshore reel. I've had experience with the powerful SL-X40HV which is equipped with a 4.9:1 ratio, but the new super fast gearing that the SealineX 50SHV offered definitely had me keyed up. Here was a reel with plenty of line capacity, the pedigree of excellent casters, and a super fast retrieve rate that made it ideal for tossing Wahoo bombs or ripping plugs for Stripers. Materials: The SealineX's body as we know it has been around for years. This lightweight reel weighs only 19.0oz, which is very light for a reel of this size and capacity. The composite frame and sideplates are all reinforced with aluminum, and all critical areas are shielded with metal. This combination is corrosion resistant, and able to withstand direct contact with saltwater. 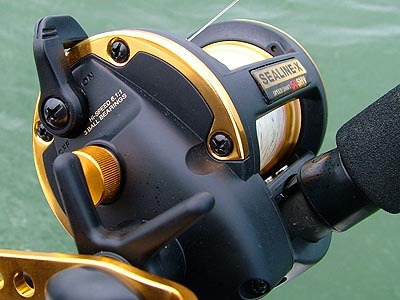 Which is one of the reasons why this series of reels has become so fashionable among surf anglers on both coasts. The spool on the SealineX 50SHV is a completely anodized high tensile aluminum, which is both very corrosion resistant and exceptionally light in weight. The Field Test: Unfortunately we were not able to test the SealineX 50SHV for Wahoo, but we were able to fish the reel in the surf as well as off the deck of our Boston Whaler targeting a variety of species ranging from Stripers to Halibut. We tested the reels casting ability when tossing big jerkbaits or Chugs for Stripers and tested the reel's trolling capabilities with a Megabait swimbait tied on at the end of the line when pursuing Bay residing Flounder and Butts. In addition we even stress tested the reel against some of the invading Humboldt Squid. 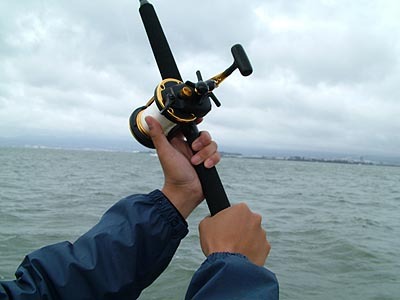 Casting/Trolling: Fishing for stripers in the surf takes fortitude, not only does your body need to stand up to the pounding surf, but your reel also must face an onslaught from the elements in the form of salt and sand. It is frustrating casting with a reel that is not capable of putting enough distance between you and your lure, as your bait simply goes slack as your lure gets caught up in the wash. Luckily for us the SealineX 50SHV was a superb caster, both in terms of ease of use and sheer distance and control. The best way to describe casting the SealineX 50SHV is that this reel feels just like an oversized baitcaster. Casting distance with 30lb line is phenomenal. The shaft completely separates the gear train from the spool on the outcast, reducing friction to a minimum. Like a baitcaster the SealineX 50SHV does have centrifugal casting brakes, but to adjust these you must remove 4 screws on the left sideplate and pull out the spool. On the plus side this reduces the chance that any contaminates can enter the guts of the reel, but on the downside you cannot adjust your brakes in the field. It is unlikely you will want to modify your brake settings in the field however, and the free spool adjustment knob can adjust the spool tension so the spool stops without overrun. Targeting stripers with this reel is made easy as the staggering casting distance allows you to stand further back, away from the crashing waves. When fishing off our Boston Whaler we tested the reel fishing large swimming jigs for stripers as well as trolling swimbaits for Flounders and Halibut. The reel has an anodized aluminum frame guard which helps prevent the line from taking any damage when it goes slack, this is a very nice feature when you are releasing line to troll or drift fish. When trolling you can engage the click function which will generate a loud audible click warning when line is drawn. The best thing about this reel is the fantastic casting ability, it feels like an oversized baitcaster!